Whether you live in the United States or not, if you study and work in the English language and are pursuing a career in aerospace, you know that it’s a difficult field to enter. It isn’t easy for anyone, in my honest opinion and experience. But for many people, there are additional challenges and barriers to overcome that have nothing to do with the technical subjects. If you’ve been involved in the aerospace education or industry world for any significant length of time (or been a reader of this website or my book), you are familiar with AIAA. The American Institute of Aeronautics & Astronautics is the world’s largest technical society dedicated to the global aerospace profession. AIAA leadership recognizes that a diverse membership is essential to the Institute’s vision to be the voice of the aerospace profession, and to shape the future of aerospace. That is why they formed a Diversity Working Group in 2015. Below, I am repeating a broadcast message that went out to all AIAA members on October 1st, 2015, from the Executive Director of AIAA, Dr. Sandy Magnus. The DWG has sponsorship and support of staff at AIAA, but it is led and conducted by AIAA members who volunteer their time & energy. I’m privileged and happy to be one of those volunteers, as the Lead for the Communications Subgroup. And we have many interesting problems still to tackle and solve in aerospace! You’ll see from the statistics here that we have room for much more progress to attract, engage, and include a representative mix of people who share a passionate goal to contribute in aerospace. With a platform like this website, it’s my pleasure and responsibility to help spread the word about this Diversity Working Group. If you aren’t a member of AIAA yet, keep reading to decide if that’s something valuable for you. If you are already a member and want to get involved, please request to join the main AIAA group on LinkedIn if you haven’t yet (after you are sure you have a LinkedIn profile established). After you are approved to join that parent group you can opt-in to the new subgroup. Any questions? Please write a comment below and I’ll be happy to answer. Thanks for your interest and drive to be your own unique type of rocket scientist! Diversity Working Group Update [From Dr. Sandy Magnus, AIAA Executive Director, 1 October 2015] As I mentioned in a “From Sandy’s Desk” earlier this year we have established a Diversity Working Group. President Jim Albaugh identified this issue as a critical one for the future of the aerospace industry as diversity of thought and experience is an important ingredient in arriving at optimal solutions to problems. The aerospace industry can only be strengthened by an increase in diversity in our workforce. The 2014 Bureau of Labor Statistics report on Household Data Annual Averages states that in aerospace engineering, 15.6% are women, 5.2% are African American, 11.7% are Asian, and 8.2% are Hispanic or Latino. 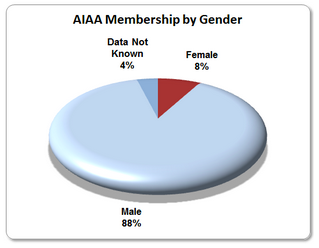 AIAA membership statistics are slightly lower in those key demographics and other identified diverse groups. The goal of the Diversity Working Group (DWG) is to ensure that we encourage participation and collaboration across all genders and races, and to enhance our representation of the entire industry. Dr. Susan Frost, Research Scientist, NASA Ames Research Center, is the DWG Chair. Four subgroups have been established: Outreach; Diversity Programming; Leadership, Growth, and Retention; and Communications. They are led by volunteer leaders appointed from the AIAA membership by Dr. Frost. To learn more about the DWG’s important work, please visit the newly established webpage at: www.aiaa.org/diversity. If you are interested in becoming involved with the DWG please join AIAA’s first-ever LinkedIn “subgroup,” which is focused on diversity. As a member of AIAA’s Diversity LinkedIn subgroup you will be notified about articles, announcements, and related discussions. You will also be able to start discussions, contribute articles, and participate in online dialogues. Encouraging and enabling that participation among AIAA members and leadership is a fundamental reason for this group. If you would like to become more directly and actively involved in the Diversity Working Group itself, please contact Susan Frost. You’re welcome, and thank you for subscribing! Happy to have you patched into the transmissions!